To place a maintenance request, send an email to lana@university-places.com giving a clear description and exact location of the problem. By sending an email you are authorizing a University Places maintenance representative to enter your house to perform the repair requested. If you feel your maintenance problem is an emergency, immediately call us. If you are in a fire or medical emergency situation call 911. Locked out of our your unit and it 20 degrees below zero . $100 fee for all lock out calls. Exterior door lock doesn’t work. Severe water leak (Please attempt to shut off water to that location and/or contain the water leak). Ann Arbor Water Department is case you need a street shut off is (734) 994-2666. No electrical service (check circuit breaker or fuse panel prior to calling). Sewer back up. If you feel you have a back up, do not use any water anywhere in the unit until we arrive. Remember, this service is for true emergencies, not routine maintenance requests! Generally no. Routine maintenance for your residence is free. However, residents will be charged for maintenance that is required due to their neglect, i.e. coins, bottle caps, broken glass, etc. jamming the garbage disposal, clogged toilets that resident has not made an effort to plunge themselves, broken windows, doors and screens. If you cannot find your plunger please call to have one delivered. Look at the plunger picture to the right. 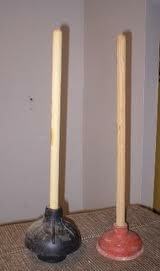 The one on the left with (the black plunger) is the kind used to plunge a toilet. Sometimes your plunger gets turned inside out and looks like the on on the right. Turn it over and see if the inside needs to be pulled out. It won’t work well unless the inside is properly positioned. Turn the water off first to avoid overflows. Watch this video for how to unclog your toilet. If you need the auger, call me. Unplug the unit underneath the sink if possible. Pull all the debris out of the garbage disposal by hand. There is a reset button on the bottom of many disposals. Press the button. There is a little crank that you can use to turn the disposal from the bottom. It looks like an allen wrench. Put it in the hole at the bottom of the disposal and turn the crank. Watch this garbage disposal video for help.